Rescue officials said the museum would showcase how the operation unfolded, adding that it would be a “major attraction” for Thailand. The rescued group are all now recovering in hospital. Video has been released showing them in good health and in good spirits, though they will stay in quarantine for a week. The Tham Luang cave is one of the largest cave systems in Thailand. It lies under the mountains around the small town of Mae Sai, in northern Chiang Rai province on the border with Myanmar. The area is largely undeveloped with only limited tourism facilities. “The area will become a living museum, to show how to operation unfolded,” Narongsak Osottanakorn, the former governor and head of the rescue mission, told a news conference. However, Prime Minister Prayuth Chan-ocha has said precautions would have to be implemented both inside and outside the cave to safeguard tourists. It’s not clear if the museum would be operational all year round, as Thailand is prone to heavy floods during the monsoon season, which lasts from June until October. Plans to turn the rescue operation into a movie are also in the works, with two production companies racing to turn the extraordinary story into a film. Even before all 13 people had been brought out, US studio Pure Flix – which makes inspirational Christian films – had announced its producers were on the ground interviewing rescue workers for a potential film. Studio co-founder, Michael Scott, lives in Thailand and said his wife grew up with Saman Gunan, the former Thai Navy Seal member who lost his life during the mission. “To see all that heroic bravery in the cave, and to get all the divers out, it’s just such a touching event and so personal to me,” he said in a video on Twitter , filmed at the rescue site. US media quoted the company as saying the film would be directed by Jon M Chu. He last partnered with Ivanhoe in directing the upcoming romantic comedy Crazy Rich Asians. Concerns are already being raised on social media that the movie could be “white-washed”, focusing more on the international characters while downplaying the role of Thais. But Mr Chu insisted on Twitter that the film would not be given that treatment. “No way. Not on our watch. That won’t happen or we’ll give them hell. “There’s a beautiful story about human beings saving other human beings. So anyone thinking about the story better approach it right and respectfully,” he said. 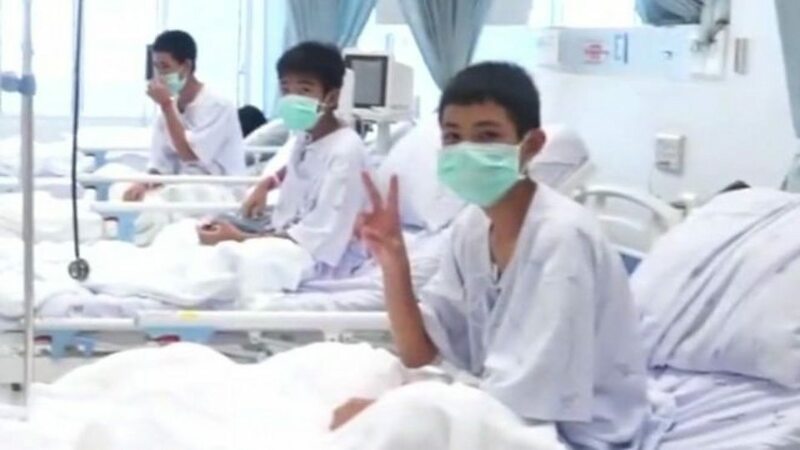 The trapped group in Thailand have now all been rescued from the cave, and are now recuperating in hospital. Their plight and the massive, dangerous three-day-long operation to free them gripped the world’s attention. The 12 boys and their coach first made their way into the cave on the 23 June, but found themselves trapped inside after heavy rains poured down and caused the cave to flood. They were found by British divers after nine days, and were eventually rescued days after in an operation that involved dozens of divers and hundreds of other rescue workers.